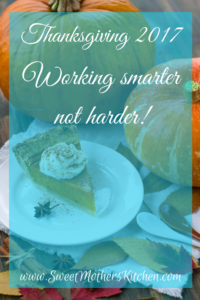 Thanksgiving Dinner – Working Smarter Not Harder! This post isn’t about recipes, it’s about work flow. This year we’re working smarter not harder! This year for Thanksgiving I’ve decided to work smarter, not harder! The reasons for this are two-fold. I want to be able to enjoy my holiday and my family (some coming from out of town), instead of spending the 2 or 3 days before Thanksgiving stuck in the kitchen, knee deep in entrees, sides and desserts. If I cook Thanksgiving dinner the way I usually do (over a 2 to 3 day period) I won’t be able to enjoy my holiday, my family or anything else because by the time I’m done with everything, stick a fork in ME, I’m done! It just takes too much out of me! Besides, who wants to work harder and not smarter! Not this girl! Not this year my friends, not this year! To accomplish my goal of smarter not harder, I had to figure out what could be made ahead and frozen without affecting the quality of my dish. After all, we’re talking Thanksgiving here! This is the time when everything you put on the table is supposed to be epic! There are certain dishes that work well for this type of meal planning like stuffing and mac & cheese. I will also prepare certain dishes up to a point where all I have to do is complete them. For example with my cornbread, I can measure out all of my dry ingredients and put them in a zip lock bag and just add the eggs, oil & milk on Thanksgiving Day, mix it, pan it up and throw it in the oven! 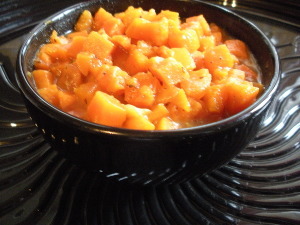 I will also prepare my pie filling (peach cobbler) and make my pie dough a day or two in advance. 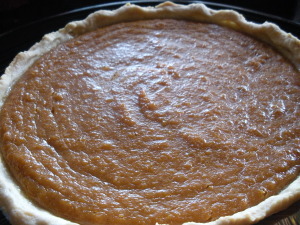 I can keep the dough & filling in the fridge or I can make the pie and put it in the freezer, ready to bake. Freezing breaks down fruit a bit more but allows me to make the pie further in advance. I will also prepare my mashed potatoes and sweet potatoes and freeze them. I’ll take them out of the freezer the day before and refresh them when heating them, Thanksgiving Day! For the mashed potatoes, that will mean adding some extra butter, half & half and heavy whipping cream. For the sweet potatoes that will mean tasting them to see if they need any more butter, sugar or spices. I’ll add my topping (brown sugar & walnut streusel) during the last 20 minutes or so of baking. My cousin is making the pound cakes and the sweet potato pies so that frees me up to make another dessert or two. I’m thinking about a 3 layer chocolate cake that my family loves, a banana pudding cheese cake that my niece has been asking for, and a strawberry pretzel salad, a dessert that always a winner with my family! The cake can be baked a couple of days in advance and put in the freezer and iced/frosted the day before. The other two desserts can both be make a day in advance. 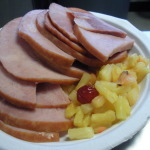 The other main dish I’m making is a baked ham, which is no problem. I’ll dress it and put it in the over and it can bake on low all night, the night before. This year we’re having two (2) turkeys because we have a lot of family coming to dinner so I need to brine them late Tuedsay and let them brine overnight. I want them to brine at least 8 hours. After brining, I will season them, stuff them, wrap them in aluminum foil and bake them in electric roasters on low all night Thanksgiving eve, like the ham. I will also make the cranberry sauce the day before to give it a day to sit in the fridge to let the flavors marry and allow it to thicken and chill. I’ll make the turkey gravy the night before and let it simmer on low overnight while the turkeys are cooking. On Thanksgiving Day early in the morning, I will put the mac & cheese and the sweet potatoes in the oven to bake about 1 ½ hours. After they come out, I’ll pop the peach cobbler in and the stuffing in for an hour. While they’re baking I can heat and refresh the mashed potatoes. Last but not least, I’ll pop the corn bread into the oven. This is the basic idea of what I plan to do. Of course, I may end up having to move one or two things around and I may even totally change something but at least I have a plan! I am transferring my plan to a flow chart that I came up with that I can put on my fridge or the counter, somewhere that I can use it as a reference as I go along and check off things as they’re done! My sister Becky is making the items that I didn’t mention so basically the green vegetables (collard greens and green beans & potatoes), rolls, potato salad, punch and whatever I’m forgetting will be on her watch! Thanks Sisterrrrr!!! In fact thanks Sisterrrrsss because my youngest sister Phyllis who is coming in from Oklahoma has volunteered to take over all things dining room! She’ll oversee getting the tables & chairs positioned, set and decorate, including setting up the buffet tables etc! That will be such a HUGH help knowing I don’t have to worry about the dining room! I almost forgot to remind you of something that for me is the most important kitchen tool of all – MUSIC! I use my Google Home because I love it! Hands free jamming and such a wonderful time because you get to hear what you want, when you want! 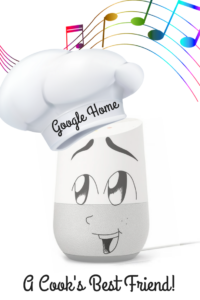 Check out my post/review about my Google Home as part of my kitchen toolkit! Believe me, it’s a must have in my kitchen! I sing, dance, cry, laugh – having your music when you’re cooking is the best – Click this link NOW! Tell me what you’re doing to make your Thanksgiving easier on those doing most of the cooking and the work, you might give us all some good ideas! Speaking of good ideas, I almost forgot, you know how after the food is in the belly, people relax and then get up, give you a kiss on the cheek and start to leave? Not this year my friends! This year I’m putting together a set up/clean up crew. They’ll help get tables and chairs in place, haul food from home stoves, fridges & ovens to the hall location where we are serving dinner. They will also help with clean up, filling and removing garbage bags, putting tables & chairs back and taking the food back to where we want it to go. I hope you’ll all take this as a word to the wise, get some help with set up, clean up and tear down or you’ll find yourself and 1 or 2 other loyal family members doing all the work yourself! Get your teams/s set up in advance so everyone will know their role. Don’t wait until the day of the event or you’re team members will claim to forget their obligation and walk away – when you’re not looking! I hope this helps to get the juices flowing, just gets things organized in your head helps a little. Follow through and commit it to paper and put it on the fridge. You’ll be amazed at how much more efficient you are! Chocolate cake layers I love this recipe from The Stay At Home Chef, she calls it – The Most Amazing Chocolate Cake Recipe – and it is! Make and bag dry ingredients for cornbread – don’t forget you need enough for stuffing and for serving for dinner! 2 PM – Turn over to the “committee” for transport to venue! This year for Thanksgiving we did the traditional oven roasted turkey with sausage cornbread stuffing, so for Christmas I did a fried turkey! Fried turkey is really good, takes a lot less time than baking a turkey – a LOT less time. How about 3 to 5 minutes per pound or until it reaches an internal temp of 165! Fried turkey, this stuff is goooood! Try it, you’ll like it! 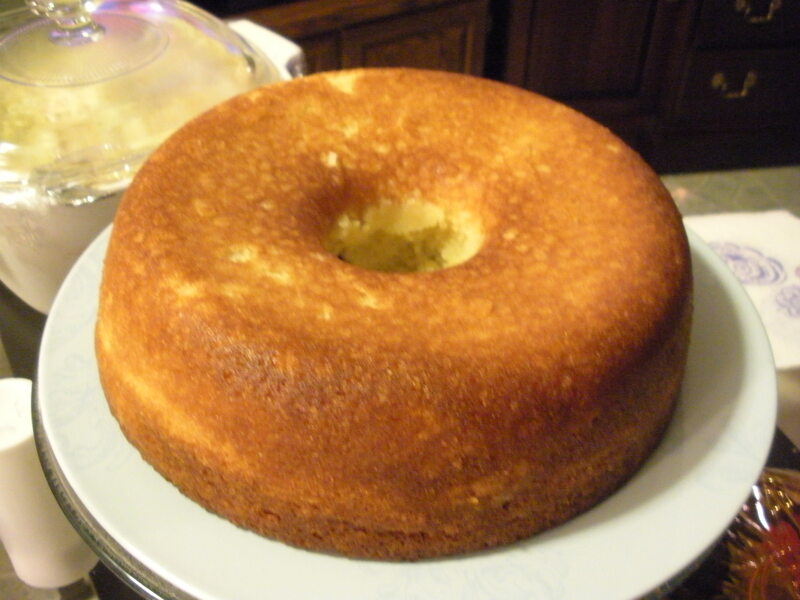 My sister Becky, got the recipe for 7-Up pound cake from my cousin Dee (Delores). Anyway, I got the benefit of their transaction and all I can say is delicious! My sister’s cake was made from scratch and was moist and luscious! 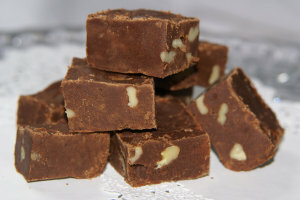 There are some recipes online using a box mix too! I say whatever floats your boat (works for you) and tastes good! Preheat oven to 350 degrees F (165 degrees C). Heavily grease and flour a 10 inch Bundt pan. In a large bowl, cream together the butter and sugar until light and fluffy. Beat in the eggs one at a time, then stir in the lemon extract. Sift flour and add to bowl alternately with the 7-Up, mixing just until incorporated. Pour batter into prepared pan. 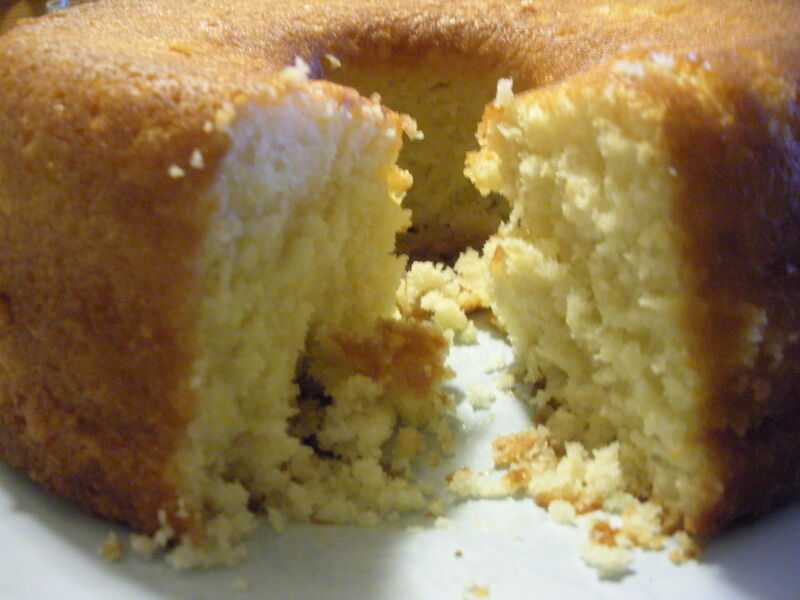 Bake in the preheated oven for 45 minutes, or until a toothpick inserted into cake comes out clean. 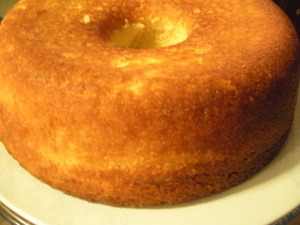 Allow to cool on a cake rack for 30 minutes before removing from the pan. 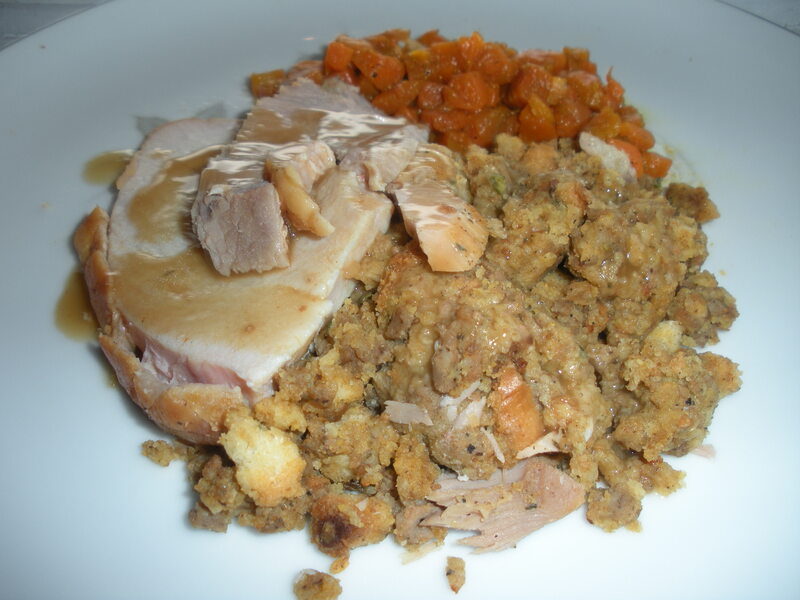 Cornbread sausage stuffing is another dish that I make that people seem to go nuts for! I think a lot of credit goes to the cornbread that goes in this stuffing – and – of course the sausage! It’s savory and spicy with a hint of sweetness. 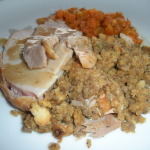 Try this recipe with your Thanksgiving or Christmas bird and let me know what you think! Serves: Cook time and yield depends on turkey size/weight. Melt butter in a skillet on stove top. Add oil to butter to keep it from burning. Add vegetables to melted butter and saute till translucent. In a large bowl add stuffing crumbs, crumbled corn bread, stove top and seasonings. Mix in cooled cooked sausage and sautéed vegetables. Add chicken broth to reach desired consistency. Stuffing should not be too wet (dripping) but it should hold together in a ball when pressed together. Rinse your turkey or chicken inside and outside, being careful to remove the giblets and put them to the side for making gravy. Dry the bird inside and out with paper towels. Season the inside of the bird with Adobo seasoning or salt, pepper, onion powder, garlic powder and paprika. Stuff the bird loosely inside the main cavity working from the leg area and under the breast skin working from the neck area. Brush the outside of the bird with melted butter and season with the same seasoning you used for the inside. Follow directions on the bird for baking. Normal baking time is 15 minutes per pound but if you stuff your turkey, your cooking time will increase. I recommend that you use an instant read thermometer and make sure your bird reaches an internal temperature of 165. 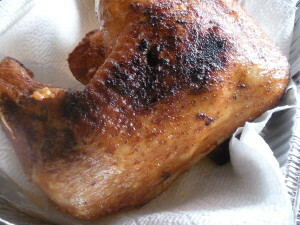 Meat should feel firm to the touch and legs should move freely in their sockets when bird is done. Rinse the giblets and put them in a 2 quart sauce pan. Cook giblets 1 to ½ hours until meat falls apart and about ⅓ to ½ of the water has evaporated. What remains will look and smell like turkey broth. After giblets are completely done, remove them from broth and add a slurry (thickener of flour and water) to the broth. Gravy will thicken immediately. Add 1 – 2 tablespoons of gravy master. Add onion powder, salt and pepper. Chop giblets into small pieces and return to gravy. Simmer 15-20 minutes. If you need more broth for your gravy add canned or carton turkey stock or turkey broth to your gravy. When cleaning chitterlings, don't believe the hype! It's a time consuming job that takes patience, diligence and good eyes. The pay off is worth it but like anything worthwhile, getting there is not easy! If the recipe tells you to clean your chitterling by dunking them up and down in water, or rinsing them off until the water runs clear, you better run clear... of that recipe! (lol) Check out how to really clean chitterlings at the bottom of our chitterling recipe. Put cleaned chitterlings into a 6 quart stock pot with 5 quarts of cold water. Add onion, habaneros, salt and pepper. Bring to a boil and then reduce flame to simmer. For the first hour of cooking, skim the chitterlings pot, discarding the foam that you skim off. While cooking, add water if needed, broth should cook down to just cover chitterlings. Do not allow to cook dry. Cook until meat is tender and some pieces fall apart when you pick up a piece with a fork (usually about 4 to 5 hours depending on amount being prepared). When chitterlings are done, remove from pot and cut up into 2-3 inch pieces. Return to pot and taste for seasoning. Chitterlings will normally be purchased at the grocery store frozen. You need to let them thaw out totally before cleaning them. Once thawed, you will take the chitterlings piece by piece, one by one and go over them inch by inch. You are looking for and removing all traces of dirt, straw, hair and anything that isn’t the actual chitterling itself. You want to remove the membrane that lines the chitterling and this removes the majority of the dirt but you must double check to make sure you get it all. You must also be sure to check both sides of the length of the chitterling for dirt and debris, removing any found. The important thing is to remove anything that has any trace of dirt or debris in or on it. This will be the fat and membrane. I have found that a 10 pound bucket of chitterlings takes a couple of hours to clean depending on how dirty they are. After your chitterlings are thoroughly cleaned, douse them up and down in clean water. I put a little bleach in my first go round of dousing water, about ¼ c to 3 gallons of water. I douse them about 5 minutes then empty the water and repeat twice without the bleach, to remove all traces of bleach. Put the chitterlings into a 5 or 6 quart stock pot and cover with water. Bring to a boil and let boil about 3 minutes. Pour off the water and refill the pot with clean water. Bring to a boil again, boil about 3 minutes, pour off water and refill with clean water. Bring to a boil, then turn flame down to medium low. Skim any foam residue that floats to the top off of chitterlings, and continue skimming until all traces of foam residue are gone. When you are finished cleaning them, your 10 pounds of chitterlings suddenly looks more like 5 pounds but who cares! All that’s important is what is left is clean and ready to cook, eat and enjoy!!! Chitterlings (Chitlins) are a delicacy and cleaning and cooking them is becoming a lost art. Due to prep time in cleaning them, I rarely fix them and if I do it’s for holidays, a special occasion or a special request from a very special person! When I do fix them, I’m always glad that I did (when they’re done and on my plate!) 🙂 If you want to fix chitterlings, please check out information on the recipe for how to clean chitterlings and how to cook chitterlings. The most important thing is to make sure that your chitterlings are cleaned and cooked properly! Enjoy!!! 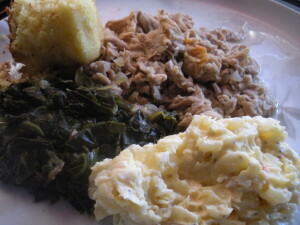 Chitlins with greens, potato salad and corn bread. Nuff said!!! 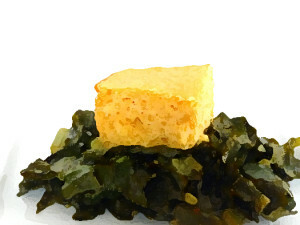 Collard greens and corn bread – nothing else needed thank you! Ok – maybe some hot sauce and vinegar, but that’s it. Such a complete meal when the right amount and type of meat is used in the seasoning of the greens. I like lots of different things, depending on what I have a taste for and what kinds of greens I’m fixing. 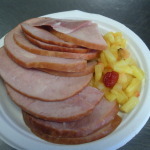 Some of my favorites are ham, ham hocks, smoked turkey wings, salt side (salt pork), smoked turkey tails, all that and then some! Well where I live it’s fall and that means early mornings are starting to get cold even though the weather heats back up during the day. I love fall weather, sweaters, boots, layers! My favorite holiday is also in the fall – Thanksgiving! But – I’m getting ahead of myself, it’s just the beginning of fall here in PA, but we can definitely rush some collards to the table. It’s still a little early for garden grown collards, because I was taught that you didn’t eat them till the first frost. This year though, we’ve almost accomplished that because already a couple of mornings it’s been in the low 40’s and high 30’s. I’ll take what I can get! 🙂 A quick trip to the green grocer, grab some collards and back to Sweet Mother’s Kitchen! Note: The baking soda in the recipe helps to tenderize your greens. 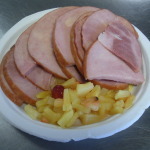 Smoked turkey gives you a healthier dish than using traditional ham hocks without sacrificing flavor! The honey butter glaze that you liberally brush on the cornbread eliminates the need to spread butter on individual pieces of cornbread! It's yummy - win - win!!! Add salt and pepper to taste and serve with vinegar and hot sauce and don't forget the corn bread!